She met the Mahatma when she was only eight and that changed her forever. The death of Poornima Pakvasa on April 25, 2016 at the age of 102 was a quiet event, away from the glare of the media. A woman of immense charm, she was stoic, resolute, decisive and lived life more intensely than most, at Dangs, her home for several decades.Born in 1913 in Ranpur near Limbdi in Saurashtra to a family of freedom fighters, Poornima met Gandhi when she was barely eight. It was an epiphanic moment that defined the rest of her life. She joined the freedom struggle at a turning point in India's fight for independence. She was one of the Satyagrahis who joined the Dandi March that Gandhi initiated as part of the mass civil disobedience movement launched on March 12, 1930. Wading into the sea to break the salt monopoly law was not only an act of defiance for the spunky young adolescent, it spelt the beginning of a new phase of a politically and socially committed life governed by her own script, her own choices. The Salt March resulted in the arrest of Gandhi together with 60,000 satyagrahis of whom more than 17,000 were women. Poornima was jailed in Rajkot in the same prison cell where Kasturba Gandhi, Manibehn Patel and Mridula Sarabhai were also incarcerated. Poornima spent her time teaching writing skills to Kasturba and other prison inmates. Over time their relationship grew close and intimate. Poornima lost her mother when she was 16, she treated Kasturba like her mother and received from her the love, tenderness and care that every daughter covets. Poornima Pakvasa's political involvement manifested itself during the 51st session of the Indian National Congress at Haripura in 1938. This session was significant because it was headed by Subhas Chandra Bose as president and threw open the differences between Gandhi and Netaji. Poornima's role as a volunteer was a tough one. The crowd was mammoth, estimated at more than half a million! A feature-length documentary of the session made by JBH Wadia of Wadia Studio documents the feverish pitch of the historical drama of which she was a part. Married to Arvind Pakvasa the same year, Poornima stepped into another very important political family. Her father-in-law Mangaldas Pakvasa was a close confidante of Gandhi who left his robust practice as a successful solicitor during the Dandi March and never looked back. He was later one of the first five governors of independent India. After her wedding, Poornima Pakvasa left the maelstrom of active political life to focus on nurturing her three children Arti, Sonal and Anuj. An accomplished Manipuri dancer and classical vocal singer, Poornima also began to support the development of classical arts traditions. Poornima's passion for social issues brought her centre stage again in 1954. 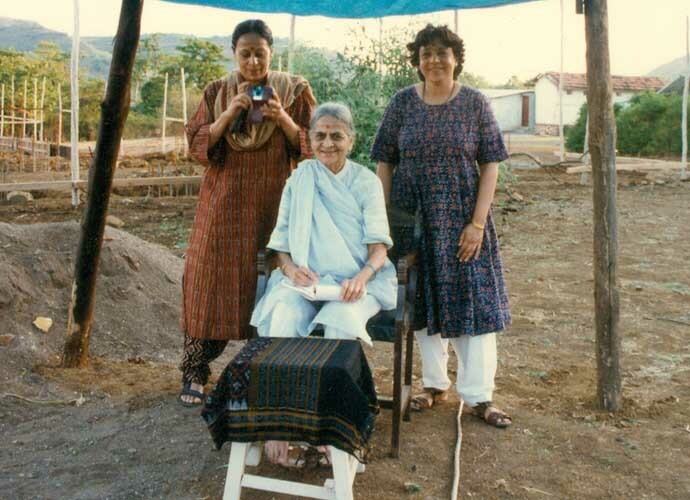 She started an organisation called Shakti Dal and for many years worked as chief of a military school in Nasik bringing into her work an incredible, incandescent energy. Her commitment to a lifetime's struggle to improve the lives of tribal girls led to the establishment of the Ritambhara Vishwa Vidyapeeth in the Saputara region of the Dangs district of Gujarat in 1974. Poornima Pakvasa's life and work at Ritambhara had an unstoppable momentum. She tried to inculcate in all the young girls mentored by her a love for education, physical training, the classical arts and strong values. Her work in the field of education was complemented by developmental work done through a Gamin Vikas Trust. She received many accolades including the Padma Bhushan in 2004 in recognition of her trailblazing work. For the simple tribals of the Dangs region she was quite simply "Didi of the Dangs" - their mentor and protector. Invited by her famous daughter Sonal Mansingh, I saw her on her 102nd birthday on October 5 last year. There was a certain stillness in the air when I reached the Vidyapeeth on a warm autumnal morning. Nestled in a Sahyadri mountain-plateau, the place looked like a nature reserve with lovely old tress, a profusion of flowering plants including water lilies and a barn with picture-postcard-perfect cows.I entered Poornima Pakvasa's small home with some trepidation. She had been very sick for some time. Her palliative care support group tiptoeing around the house seemed to be indicative of an impending end-of-life crisis. And yet it was not a crisis. She looked beautiful in repose; dressed in an immaculate white khadi saree, a big kumkum bindi adorning her forehead. The medication and drug regime was down to basics. She was on a semi-fluid diet. She was not being tube fed or catheterised. Here was a Gandhian being allowed a very gentle Gandhian death in the convalescent tranquility of her own home. When she lived Poornima Pakvasa touched thousands of lives. She will continue to live through her legacy and work. Hers was a life that inspires legends. The author is a civil servant and a writer.